Even though lionfish are predatorial and consume lots of other fish and shrimp, this study of mercury levels in lionfish from Florida shows that lionfish have less mercury per kilogram of fillet than most other popular fish. In their testing it was found that lionfish on average had just .07 mg/kg of mercury in their meat compared to levels of .91 mg/kg for Black Grouper, .25 mg/kg for Yellowfin Tuna, and 1.51 mg/kg for King Mackerel. 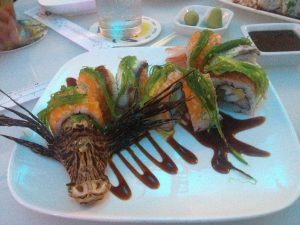 While many of the other popular fish are listed by the Florida Department of Health as recommended to only eat once or twice a week due to mercury levels, the lionfish has NO health restrictions due to mercury. This is possibly due to the fact that lionfish, being relatively small, feed on relatively small fish that have not built up a lot of mercury in their systems. Lionfish are the ultimate sustainable seafood because they are an invasive species and we are trying to reduce their population. We can never ‘over harvest’ lionfish because they are invasive and our goal is to remove as many as possible, which is why the Monterrey Bay Aquarium Seafood Watch has listed lionfish as one of the ‘best choice’ sustainable seafood. We all know about the increasing pressures that a growing population are putting on our limited ocean supply with heavy commercial over fishing, but when it comes to lionfish there is no need for guilt, we are doing the ocean a favor with every lionfish we eat! Because lionfish are rarely caught on hook and line, combined with the fact that we don’t allow fish trapping in the ocean of the United States, most lionfish are currently being harvested by divers using short pole spears and scuba gear. Hunting lionfish is labor intensive, and there is no such thing as large commercial vessels scooping up heavy quantities of lionfish such as is done with many other species. While many lionfish are harvested as bycatch in lobster traps, the vast majority of commercially harvested lionfish come from individual divers out supplementing their income. Florida has made it very easy for recreational divers to hunt and sell their lionfish with a simple $50 license which you can learn more about here. Lionfish is a healthy choice of fish to eat as they are shown to have a higher concentration of heart healthy Omega 3 fatty acids and a lower concentration of Omega 6 fatty acids. This all helps your cholesterol as the fatty acids in lionfish help to lower your bad cholesterol (LDL) and raise your good cholesterol (HDL). These numbers mean lionfish is one of the healthiest available choices. Lionfish in the Bahamas have been estimated to eat 1000 pounds of native fish per acre per year! Every lionfish that is removed from the reef to be served as a dinner is not out there consuming our baby grouper, snapper, lobster and other vital commercial species. Lionfish have been confirmed to eat over 70 different types of our native species making them one of the greatest threats to marine biodiversity in the western Atlantic. If only more of the world’s problems tasted so good! Eating lionfish is not only great for the environment, it’s also one of the best tasting fish on the reef! It’s a white, flaky meat similar to snapper and a lot better than tilapia. With a relatively neutral flavor the lionfish can be prepared any way that you prefer to eat your fish. We’ve seen some very stunning presentations of whole lionfish on the plate as well since cooking neutralizes the venom in the spines. 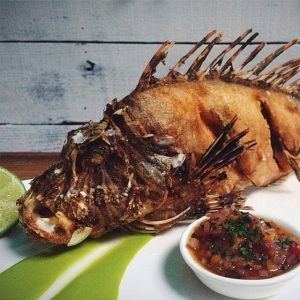 Check out our growing list of restaurants that serve lionfish to find one near you. Thanks for the informative article. I will repost to continue in efforts to educate the public of our Lionfish invasion. Thank you for sharing this. 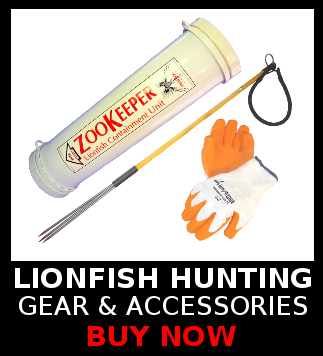 I am looking forward to the Lionfish Removal and Awareness Day in Pensacola in May. I’m also having broiled lionfish withdrawal! « Why is a lionfish called a lionfish?